Are you looking for new ways to earn money as a writer? If so, and if you live in Birmingham, Ala., you need to mark your calendar for the next See Jane Write event, set for Tuesday, Aug. 28 at 5:30 p.m. at Matthew's Bar & Grill. Author and freelance writer Nancy Dorman-Hickson will present "A Ghost Story: My Life as a Co-Writer and Print/Web Writer." She'll include fun experiences she's had as a writer such as the strangest places she's taken her laptop or conducted an interview; techniques for capturing a personality; and the ego-boosting (and ego-crushing) acts of creating personal bios and author photos and participating in book signings. Before freelancing, Dorman-Hickson was an editor for Southern Living and Progressive Farmer magazines during which time she received praise for her writing from Harper Lee, Pat Conroy, Naomi Judd, Fannie Flagg and many more. She is the ghostwriter of a book on family violence and the co-author of Diplomacy and Diamonds, the best-selling memoir of Texas socialite Joanne King Herring, who was portrayed by Julia Roberts in the movie Charlie Wilson’s War. You can learn more about at Dorman-Hickson at www.NancyDormanHickson.com. Ghostwriting may be something you've never considered because there's no fame or glory in this line of work. "In fact," Dorman-Hickson said, "ghostwriters sign contracts agreeing not to tell anyone that they worked on the book at all, thus the term 'ghost.'" So why would anyone want to be a ghostwriter? For the money, honey! "It can be a lucrative field," Dorman-Hickson said. "The figures are all over the board. I've heard everything from $2,500 to $100,000, but those high-figures come about only after a writer has deep experience and a lot of luck." Still, if ghostwriting is completely out of the question for you, there's always collaborative writing, such as Dorman-Hickson's project with Joanne King Herring. On the cover of that memoir you'll also find Dorman-Hickson's name. "It can mean good money in a time when writers are having a hard time getting assignments and being paid adequately for their work," Dorman-Hickson said. "Also it is fulfilling to complete a book, especially when it bears your name." 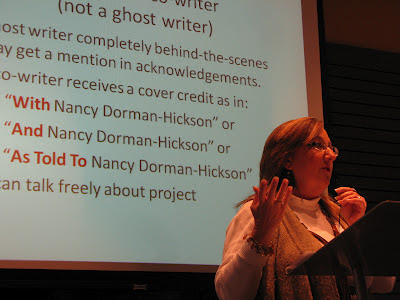 For those wondering if ghostwriting or collaborative writing is for you, Dorman-Hickson said, "If you are a writer who enjoys knowing what you're going to be writing and what you're going to be working on for a long period of time, book-length projects are ideal. They provide security in the topsyturvy world of freelancing. You use the same skills you use with other types of writing. You just use them for a longer period of time focusing on the same subject." 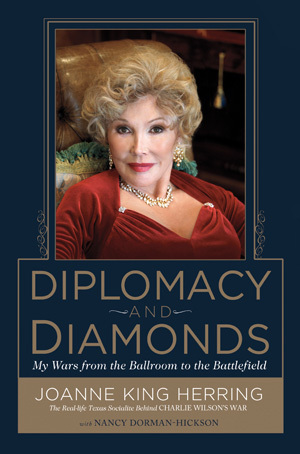 Dorman-Hickson will have copies of Diplomacy and Diamonds for sale (cash or check only) for $25 at the event. In addition to information on ghostwriting and collaborative writing, Dorman-Hickson will also discuss how to freelance for magazines, websites and other publications and how to build your brand as a writer. When: Tuesday, August 28 at 5:30 p.m.
Special thanks to our venue sponsor Matthew's Bar & Grill. Please support Matthew's by purchasing food and/or drinks at this event. so you can really know things about jane and how he works for all of us. click site like this to check things for your paper to check it. Paul bishop has a huge fan base who are really fond of his writings. You should go here to get the better similarity checker service within time.